The pillow looks great! I love your fabric choices. I’m going to try machine quilting in a few weeks and I’m scared silly. I’ve got my eye on that Angela Walters book too. Someone from my quilt guild brought a quilt they had FMQ’ed with wood-grain pattern! They said it was AW’s design. It was spectacular. Cute pillow. I need to make one someday. You should! I didn’t link to the pattern in this post, but you should be able to find it if you google Anna Maria Horner Spinning Stars pattern. It’s free! In an interesting turn of events I had my first hand quilting experience with my spinning star test block and I am also turning it into a pillow. How funny. Your’s looks great btw. 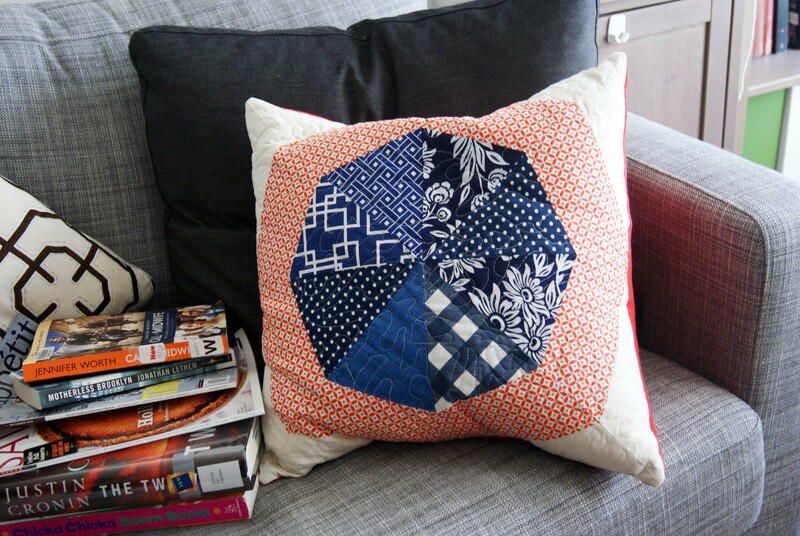 A pillow is the perfect place to practice FMQ because if you get weird tension issues on the back you won’t be able to see it in the finished product.